The bell-shaped flowers of F. persica grow on tall, spindly stems. They combine perfectly with the F. imperialis varieties (both require soil that drains quickly and thoroughly) and adding some late-flowering white or yellow daffodils (narcissi) will create a majestic display of colours. Yearly flowering is assured by digging up the bulbs in mid Summer, storing them in a paper bag in a relatively warm location before re-planting them again in early Fall. In flower- and perennial beds and borders. Apply some granular bulb fertilizer in early Spring just as growth starts and. After blooming remove the flower heads but leave the foliage to die back naturally and again add a bit of bulb food. Leave the bulbs in the ground since they usually flower even better in the second year. When the clump has stopped producing blooms after several years, do divide them. The best time to do this is after the foliage has almost completely died down. Replant quickly. (Besides the species itself); 'Alba' (white) and 'Ivory Bells' (ivory-green). 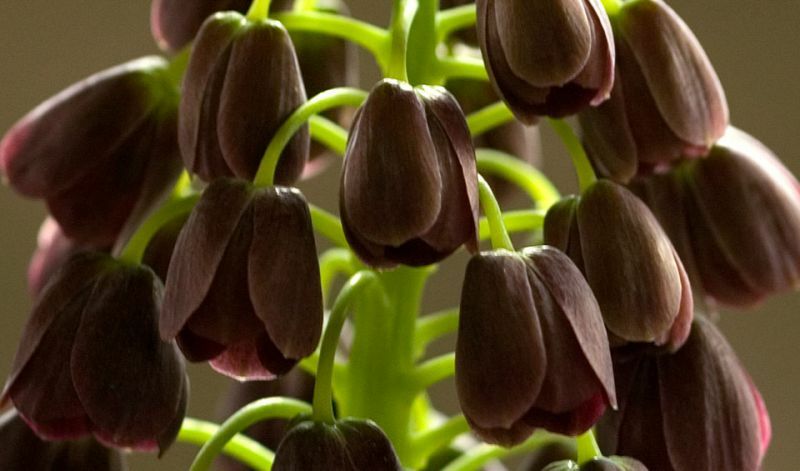 Fritillaria is a genus that consists of about 100 species. They are native to the temperate regions of the Northern hemisphere. The name is derived from the Latin name for a dice-box (fritillus) and probably refers to the checkered pattern, quite often of chocolate brown and greenish-yellow, that is common in the flowers of many species.